The brilliant intuition of the work is anterior of ten years to the final realization, completed in 1995, after a long series of problems and bureaucratic difficulties. The Obelisk Lancia di Luce enriches and characterizes the town of Terni thanks to the genius of the sculptor Arnaldo Pomodoro (born in Morciano di Romagna in 1926), designing an invisible linen linking it indissolubly to other cities hosting the works of the artist, such as Tokyo, Dublin, Copenhagen, New York, Los Angeles, Moscow, Darmstadt, Spoleto, City of the Vatican and others. The spear of light is located at the end of Corso del Popolo, one of the main roads of the urban traffic and, thanks to its light profile, it dominates in an incredible way the surrounding space without disturbing it. The work is at the same time representative of the technological advances and an alert towards them; the drama of their founding and of the relative powers is expressed through an series of fractures, inserts, geometric forms and effects of light. 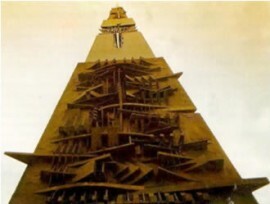 Like in its previous realizations, Arnaldo Pomodoro has underlined the contrast of external superficies polished and lightly, lacerating themselves revealing an organic cavity, allusive and erosive materiality. Its aim, as he himself declared is always the one of " giving life to things related to the urban environment, the social tissue. The sculpture should be lived." Although it has been assembled with industrial techniques, it seems to transcend its material being, specially in the slim aspect of the final part, so pointed to launch itself towards a superior spirituality. The fascination of the work is also made of its aspect that transforms in relation under the visual point of view of the observer and the different light of the moments of the day, or of the seasons, when for example during the winter mornings it slowly comes out of the fog. Bella Umbria thanks Federico Fratini for the collaboration in the realization of this article.